SONIC Drive-In Celebrates 10 Years of Supporting Teachers with $1 Million Donation | Sonic Corp.
OKLAHOMA CITY--(BUSINESS WIRE)--Oct. 1, 2018-- Today, SONIC® Drive-In (NASDAQ: SONC), the nation’s largest chain of drive-in restaurants, kicks off the 10th annual Limeades for Learning Fall Voting campaign in support of public school teachers. SONIC fans can make a big impact on the nation’s teachers and students by directing SONIC’s $1 million donation to classrooms across the country. In partnership with DonorsChoose.org, this national consumer-driven philanthropic campaign gives teachers the opportunity to request the learning materials they need, and asks SONIC fans to get involved by voting daily for the teachers they want to support. In addition to the $1 million donation for Fall Voting, SONIC also makes large-scale donations at other times of the year. To date, SONIC has donated a total of $10.4 million since Limeades for Learning launched in 2009, which has impacted over 600,000 students. SONIC, America's Drive-In is the nation's largest drive-in restaurant chain serving approximately 3 million customers every day. Ninety-five percent of SONIC’s 3,600 drive-ins are owned by local business men and women. For 65 years, SONIC has delighted guests with signature menu items, 1.3 million drink combinations and friendly service by iconic Carhops. Since the 2009 launch of SONIC's Limeades for Learning philanthropic campaign in partnership with DonorsChoose.org, SONIC has donated $10.4 million to public school teachers nationwide to fund essential learning materials and innovative teaching resources to inspire creativity and learning in their students. To learn more about Sonic Corp. (NASDAQ/NM: SONC), please visit sonicdrivein.com and please visit or follow us on Facebook, Twitter and Instagram. 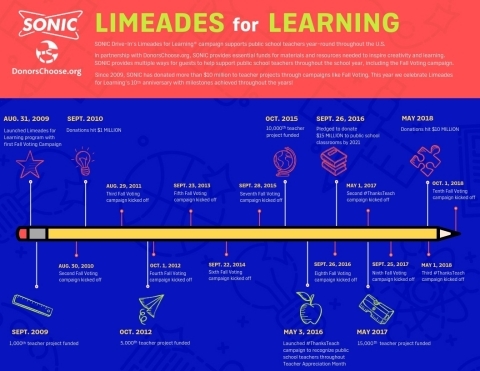 To learn more about SONIC's Limeades for Learning, please visit LimeadesforLearning.com.